Scientists from the University of Notre Dame, The Nature Conservancy and Central Michigan University have presented their findings of Asian carp DNA throughout the Great Lakes in a study published in the Canadian Journal of Fisheries and Aquatic Sciences. Some recent reports regarding environmental DNA have suggested that birds, boats and other pathways, but not live fish, are spreading the bighead and silver carp DNA. According to the U.S. Geological Survey (USGS), in 2010 commercial fishermen captured a 20-pound bighead carp in Lake Calumet, 30 miles above the electric barrier meant to block the advancing carp from the Illinois River. Lake Calumet is seven miles of river away from Lake Michigan. 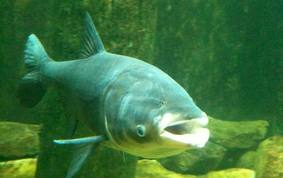 Likewise, in 1995 and twice in 2000, USGS records indicate that bighead carp were captured in the western basin of Lake Erie. “It shouldn’t be surprising that we found evidence of Asian carp in these areas where Asian carp were already known to exist from captures,” said Lindsay Chadderton, co-author on the paper and director of The Nature Conservancy’s Great Lakes Aquatic Invasive Species program. This study builds upon a growing area of research to find invasive species when they are at low abundance and can be potentially managed. 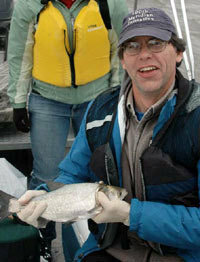 This work is part of a Great Lakes Restoration Initiative project funded through the U.S. Fish and Wildlife Service to help develop a program of invasive species surveillance of the Great Lakes. This research grew out of a formal partnership between Notre Dame and The Nature Conservancy, one of the world’s largest and most established conservation organizations. The mission of Notre Dame’s Environmental Change Initiative is to conduct innovative research that helps to solve complex environmental problems regarding invasive species, land use and climate change, focusing on their impacts on water resources. The Nature Conservancy is a leading conservation organization working to protect the most ecologically important lands and waters around the world for nature and people. For more information or to watch a video, visit nature.org/carpscience. The Notre Dame-TNC partnership is designed to develop science-based solutions to environmental problems. The Institute for Great Lakes Research at Central Michigan University is committed to promoting and facilitating collaborative research and education on the Great Lakes. The institute partners with other institutions and agencies to leverage expertise and training and takes a multidisciplinary approach to understanding the complex environmental issues affecting the Great Lakes basin. The Canadian Journal of Fisheries and Aquatic Sciences (CJFAS) is one of the world’s top fisheries journals and is the primary publishing vehicle for the multidisciplinary field of aquatic sciences. It publishes perspectives, discussions, articles and rapid communications relating to current research on cells, organisms, populations, ecosystems or processes that affect aquatic systems. The journal seeks to amplify, modify, question or redirect accumulated knowledge in the field of fisheries and aquatic science. Originally published by William G. Gilroy at news.nd.edu on April 04, 2013.